History was made on the 7th of May, as the man of God and BLW President, Rev. (Dr.) Chris Oyakhilome, visited the nation of Zimbabwe for the first time, to worship and have communion with over 75,000 people at the National Sports Stadium in Harare. The program, which was a triumph of faith for members of the BLW Nation in that country, also impacted millions around the world via LIVE broadcast. "We envisioned it, hoped for it, prayed for it and finally it has become a reality," the esteemed Zonal Pastor of Southern Africa Zone 5 and Pastor of Christ Embassy Zimbabwe, Pastor Ruth Musarurwa, said with great elation to the crowd present. The zone, which emerged out of a small cell with a dream of becoming 50 strong, had a lot to worship and praise God for, as each world-renowned music minister took the stage. Eternal impressions were made in the hearts of everyone present, as they listened to stirring testimonies of the impact of God's Word, prayed for their nation and lifted holy hands, offering up the fruit of their lips to God. It is not an encounter to be forgotten in a hurry, leaving an indelible imprint on the soul of Zimbabwe as a nation. Catch some highlights of this historic event in the featured video. God's Power Saturates Zimbabwe's National Sports Stadium as Thousands Worship. Relive special moments of worship with the Zimbabwe choir and Flames, Jahdiel, other music ministers. As its name suggests, the Worship and Communion Service with the man of God, Pastor Chris, was, first of all, a divine experience in spiritual obeisance, as thousands poured out their hearts to a faithful God in reverence and gratitude. With each ministration by LMAM All-Stars, the congregation was lifted to higher realms of glory, making way for the miracles that would follow, upon Pastor Chris' arrival. Relive some of the moments of true worship as the featured video takes you through excerpts from ministrations by the Zimbabwe choir and globally renowned music ministers such as Jahdiel, Flames, Israel Strong and Sister Wisdom. What a time of refreshing it was at the Worship and Communion Service with Pastor Chris in Zimbabwe. BLW President catalyzes new beginning for Zimbabwe through Worship and Communion Service. The people came out of all corners of the nation and nearby countries, full of expectation and convinced that God had prepared a milestone season, a special word for the nation, as a whole. After a rousing and warm reception with a standing ovation from the crowd, Pastor Chris sensed the people's faith and stated unequivocally, "your nation is about to witness a new beginning, and the Lord sent me for that purpose." The prophet of God to the nation of Zimbabwe, on this particular occasion, also took some time to encourage the people through the Spirit; "in spite of the difficult times that you have had as a nation, Zimbabwe remains a jewel of Africa," the BLW President said. With every anointed word, healing took place in the soul of Zimbabwe as a whole. "Young people, I tell you, be proud of Zimbabwe!" — Pastor Chris at Worship and Communion Service. 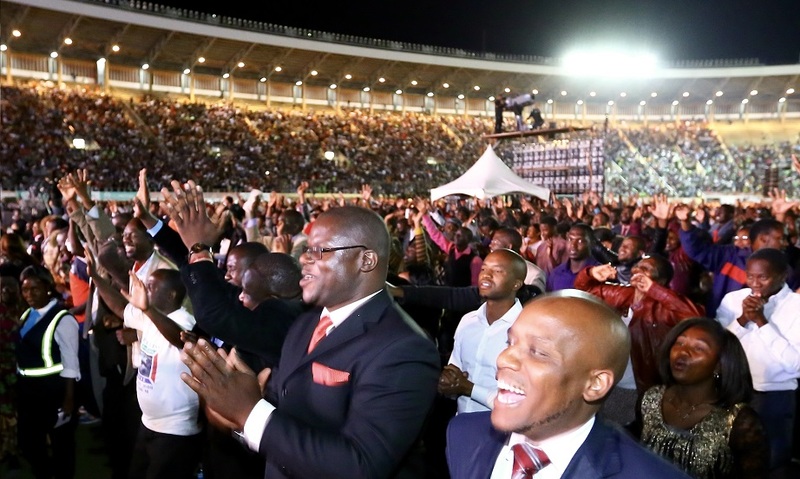 The impact of the Worship and Communion Service with Pastor Chris at the National Sports Stadium in Harare reached into every aspect of the nation's fabric, addressing the rich, the poor, the government and more, but especially the youth. The BLW President, as he has been known to do in several nations around the world, inspired a patriotic spirit in the youth of Zimbabwe, as he said to them, "young people, I tell you, be proud of Zimbabwe!" Pastor Chris continued, saying "because you have it inside you, you can rebuild your country." He took their eyes off the difficult times the nation is enduring to fix them on the hope of a glorious future residing in the youths. Further qualifying his emphatic statement about Zimbabwe's hope for a glorious future, the man of God referenced the raising of many ministers of the Gospel in the nation as the sign of God's thoughts concerning Zimbabwe and his hand upon her. "Wherever the Gospel thrives…there’s hope," Pastor Chris educated the congregation.